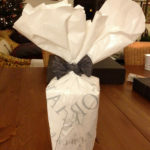 I love wrapping gifts. 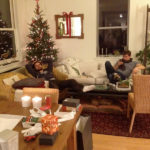 I knew my friends Sara and Scott had done lots of shopping, so I volunteered to wrap some of their gifts for them. 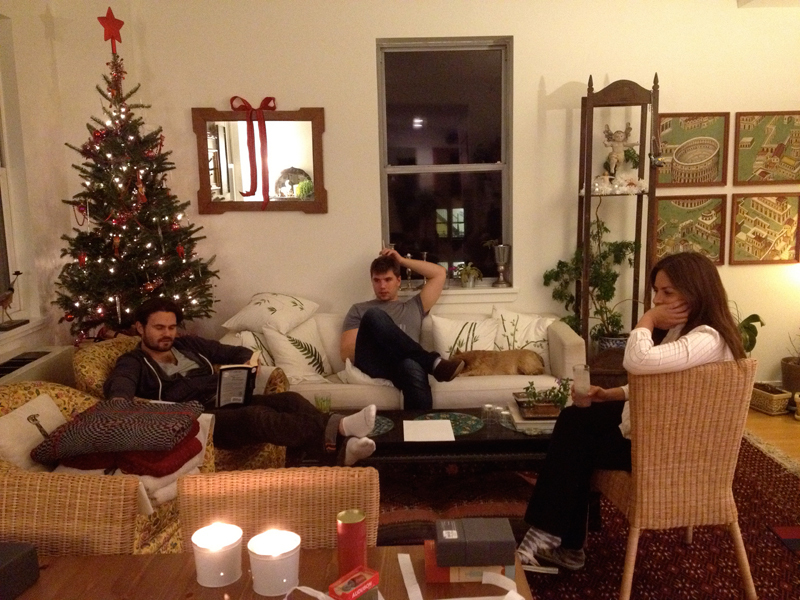 In exchange they treated me to dinner! 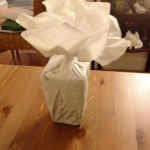 Of course, I don't use store bought ribbon, wrapping paper, or even tape! 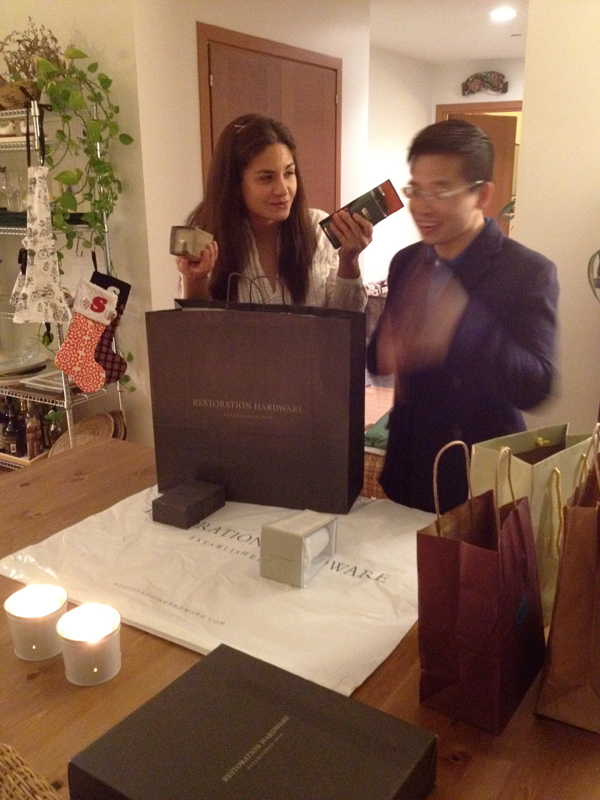 When I told Sara I was going to wrap her presents in the shopping bags they came in, she was a bit skeptical. I'll show you four ways to wrap all your gifts without spending more money on wrapping supplies. 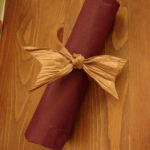 Your gifts will look great and you'll save money! 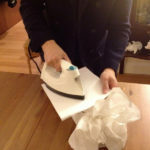 All you need is a pair of scissors, a clothes iron, a piece of copy or parchment paper, and paper or plastic shopping bags. 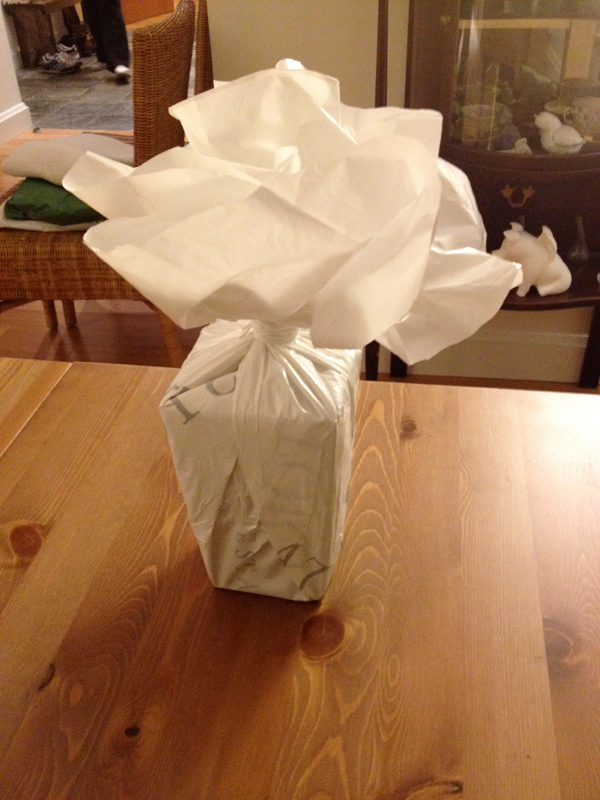 This works great for odd shaped gifts. 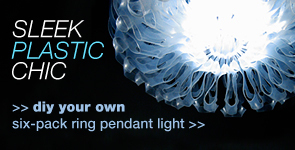 Cut open your plastic bag. 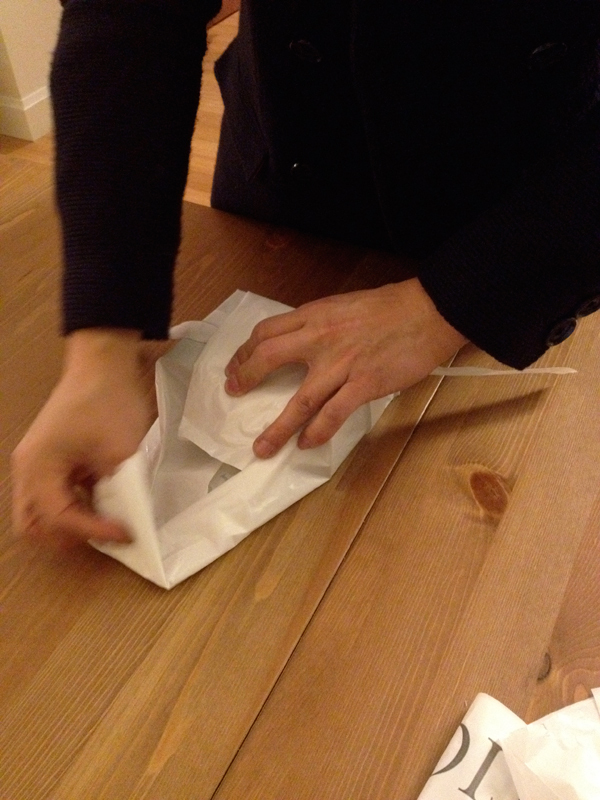 Fold the plastic bag in half , making sure the printing is on the inside. 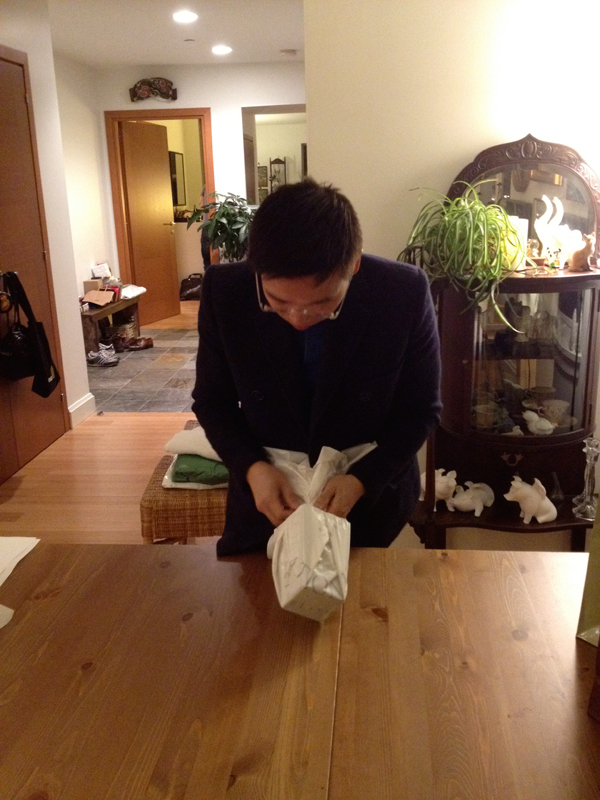 Put the gift in the center of the plastic. Gather the plastic at the top. 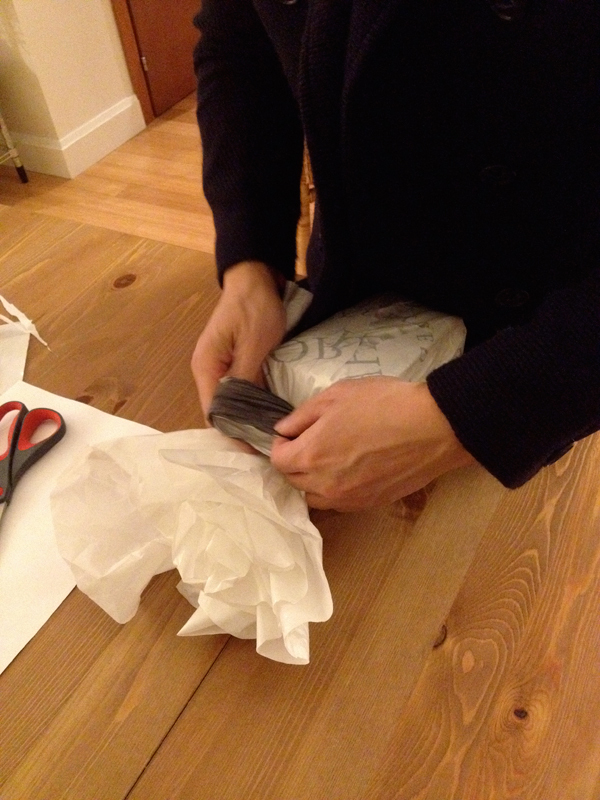 While holding the gathered plastic together, make pleats around the gift. 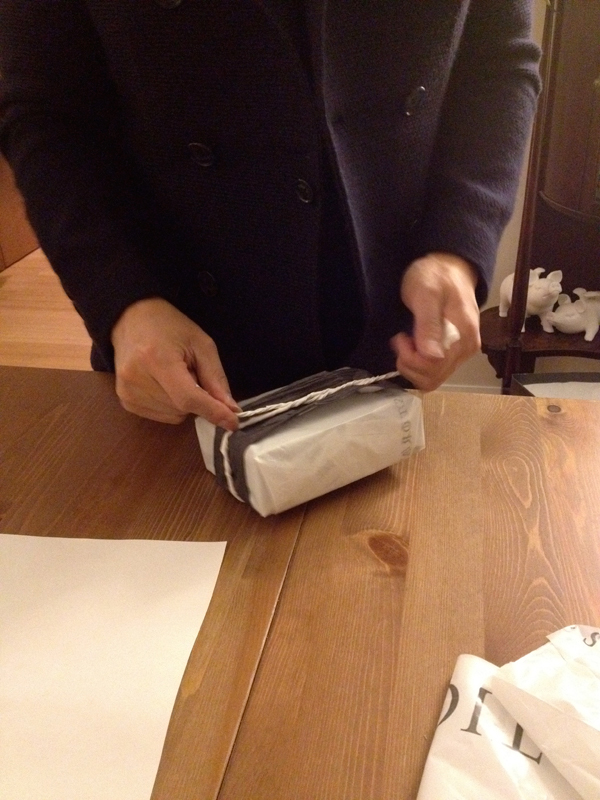 Use the plastic ribbon to tie the top closed. 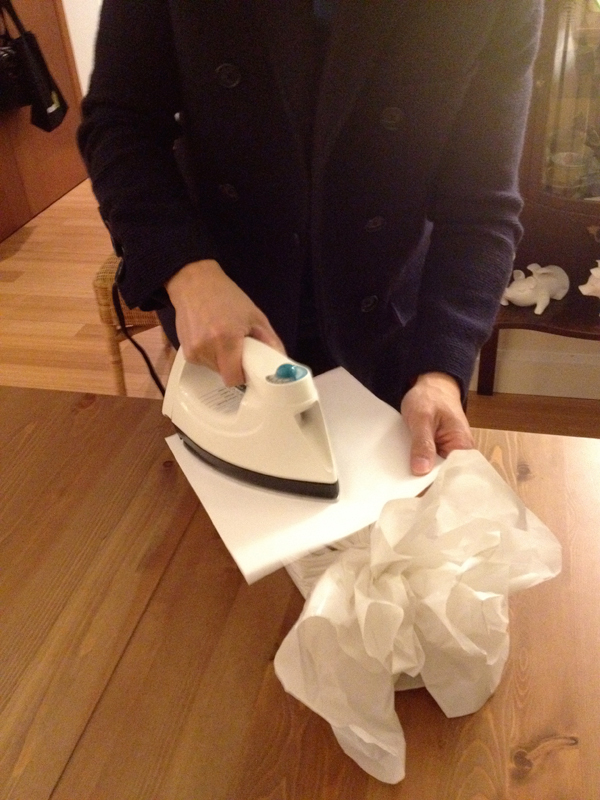 Place a piece of copy paper on the top of the gift and lightly iron the the plastic (rayon or polyester setting). This will smooth out the plastic and make the pleats crisp. 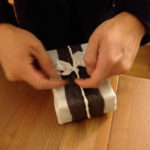 Use a second ribbon to tie a bow. 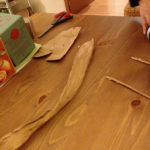 Cut three long strips from the plastic bag for ribbon. 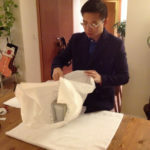 Cut the plastic sheet to size. 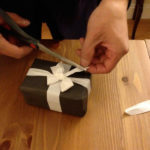 Wrap the gift as you would normally. 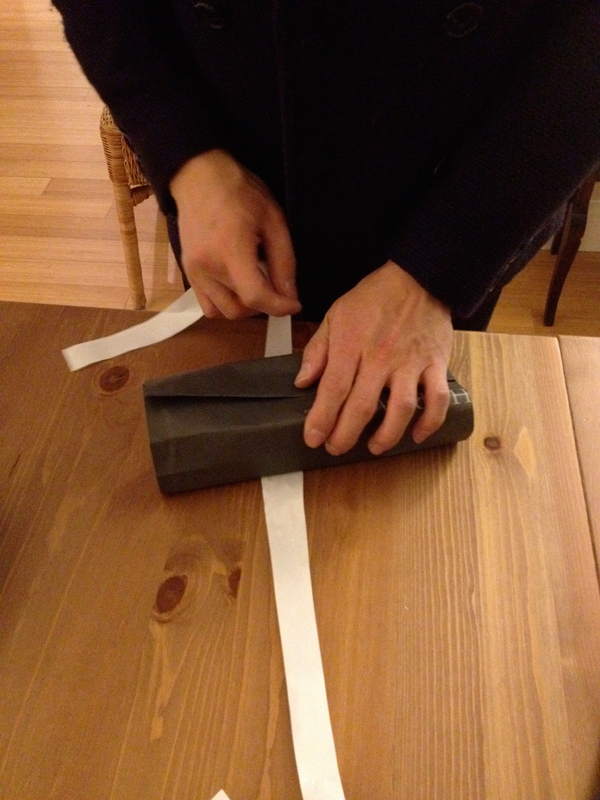 Cut strips of plastic ribbon and use them as if they were tape. 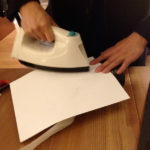 Place a piece of copy paper on the top of the plastic "tape", and lightly iron the the plastic (rayon or polyester setting). This fuses the plastic together. 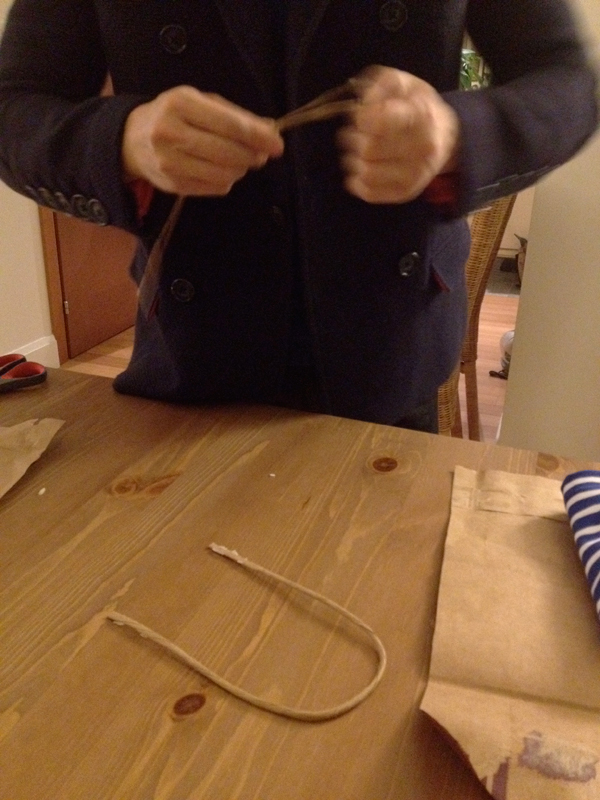 To create plastic cording you'll need to twist two ribbons individually. 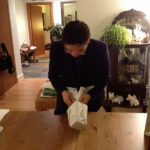 Then twist the two individual ribbons together. 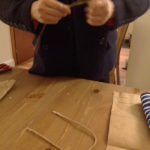 Knot both ends and lightly stretch the entire length to smooth out the cording. 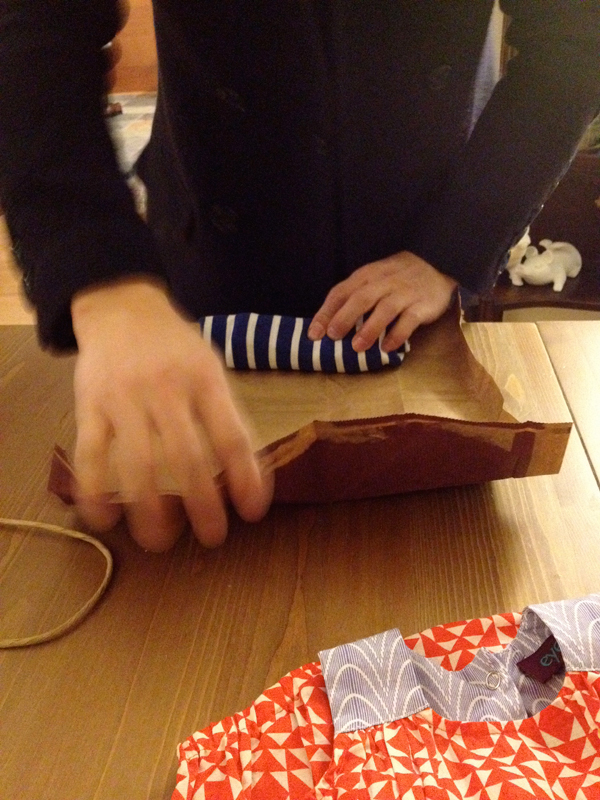 Tie the cording around the gift. 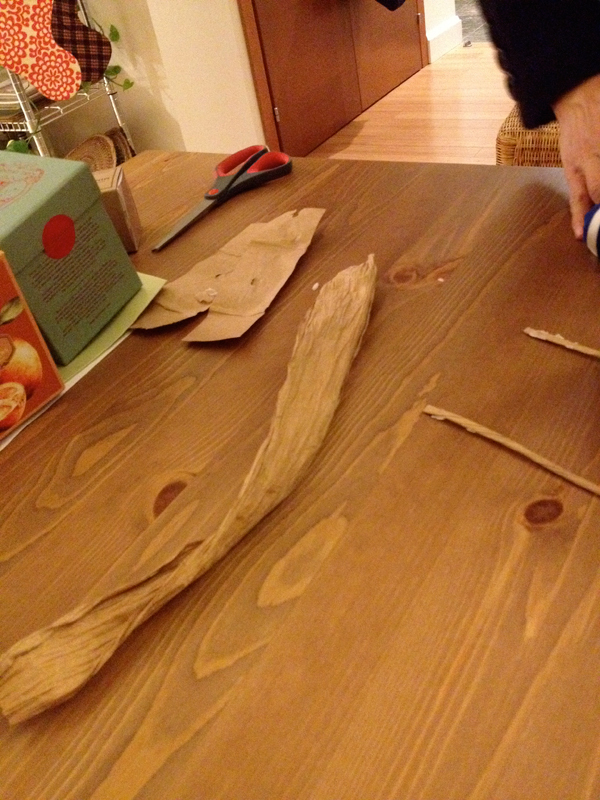 To make a bow, cut the knots off. 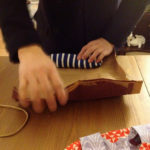 Cut open your paper bag. You can use the inside or outside. 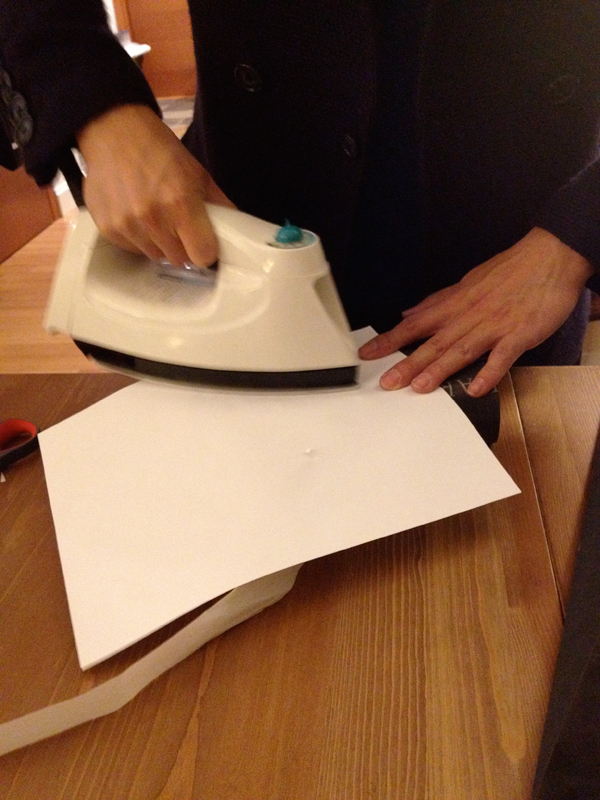 Cut the paper sheet to size. 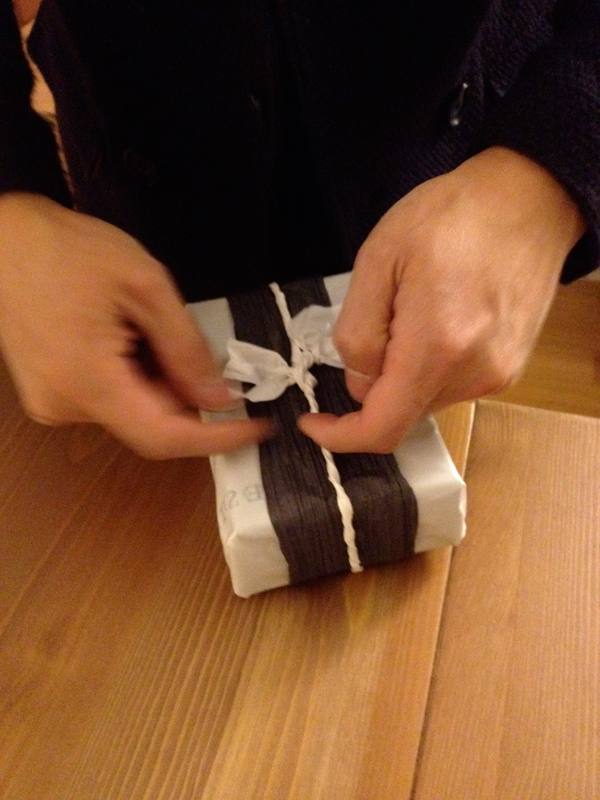 Holding the paper in place wrap a plastic ribbon around the gift to secure the paper. 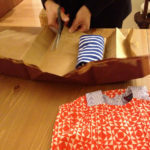 Place a piece of copy paper on the top of the plastic ribbon, and lightly iron the the plastic (rayon or polyester setting). This fuses the plastic together. Cut off the loose ends of the plastic ribbon. 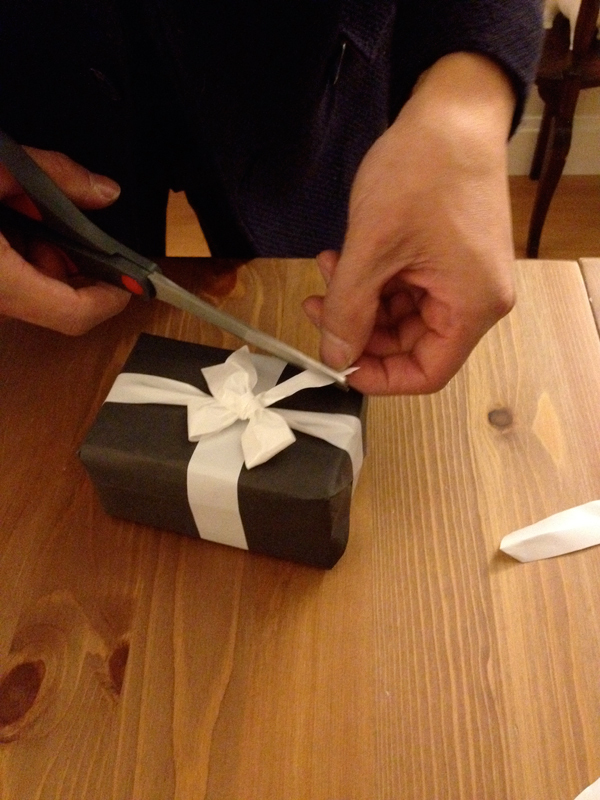 Tie a bow with the second ribbon in a perpendicular direction to secure the openings on the ends of the gift. This works great for articles of clothing. 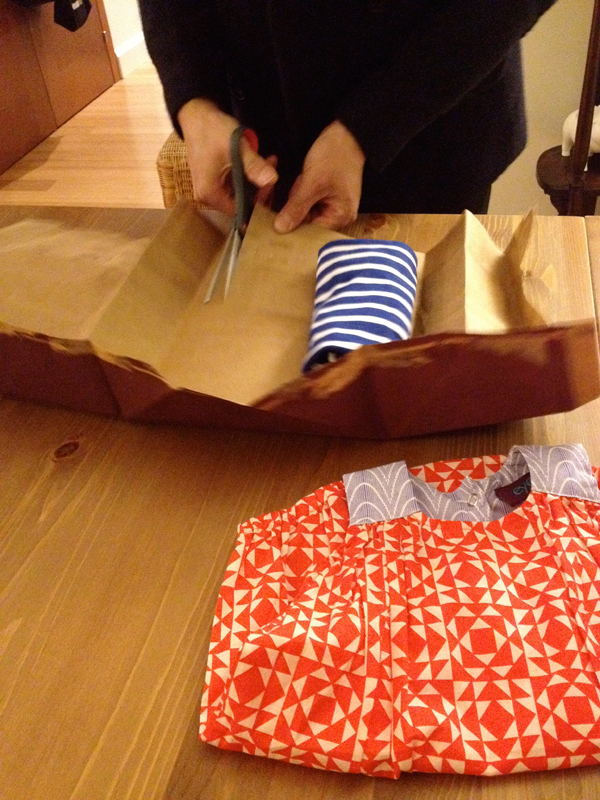 If you are wrapping clothes, roll it up. 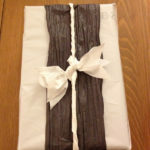 Otherwise your gift should be tubular shaped. 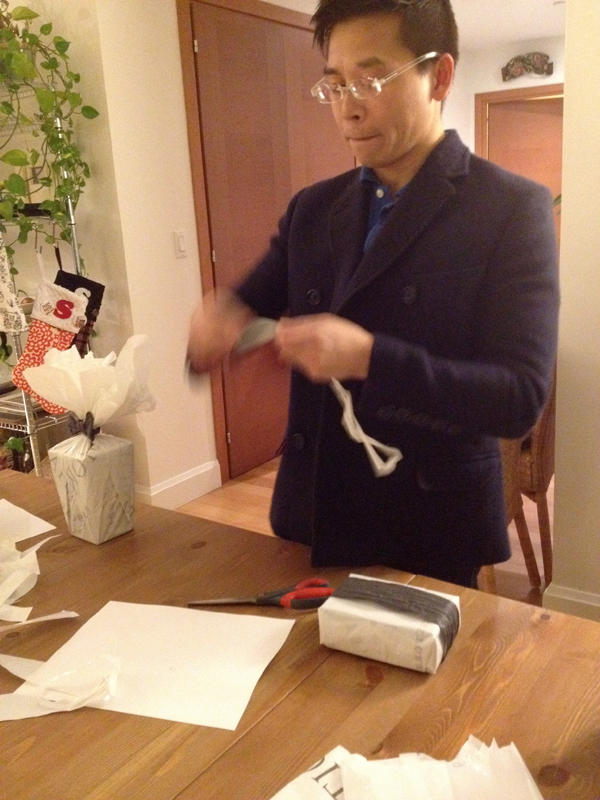 Cut the paper sheet to size, leaving extra room on both sides of paper that is at least half the diameter of the gift. 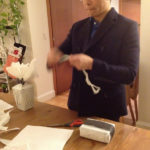 Carefully unfurl one handle to make a ribbon. 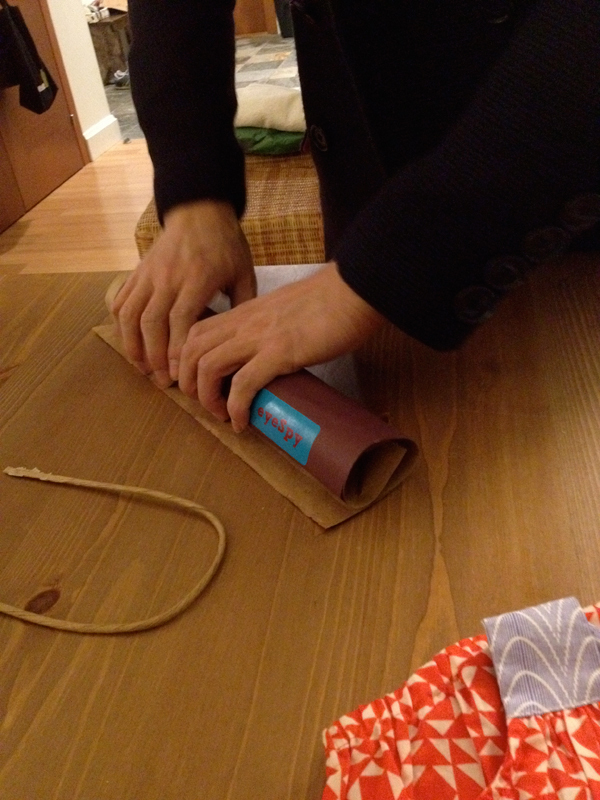 Roll the gift in the paper. 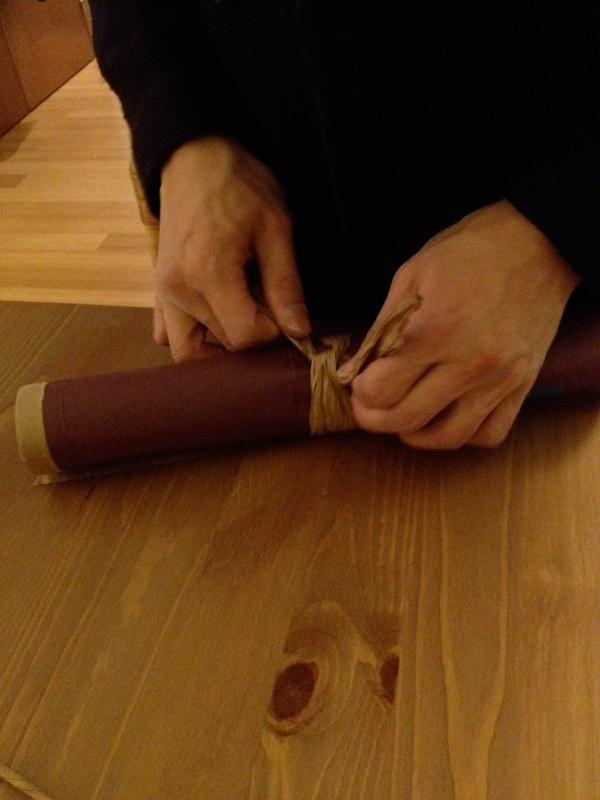 Tie the ribbon around the tube to secure the paper. 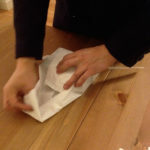 Tuck the ends of the paper inwards. 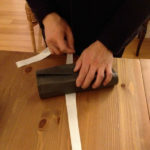 One reader of Relevé Design, Jolyn, tried out the rolled technique with a manilla envelope and a handle from another shopping bag to wrap her husband's sweater. 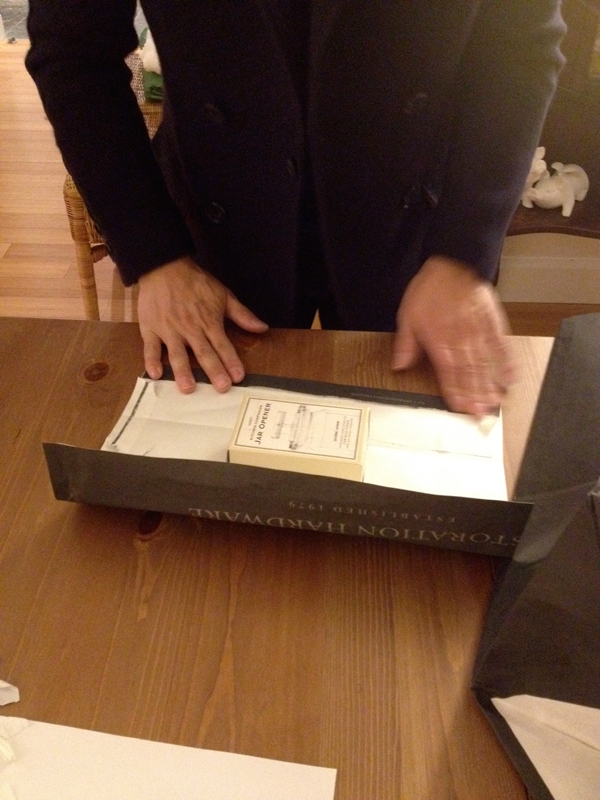 The envelop wasn't wide enough to completely enclose the ends. She stood it up on it's end and stuck a Santa hat on it. Now that's thinking on your toes! Great job, Jolyn! 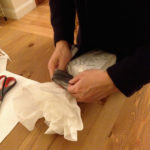 For more details on how to work with plastic bags check out my tutorial "HOW TO fuse plastic bags". 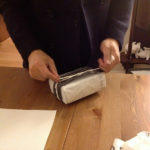 Hey ur really amazing Bao I love this idea not only is it enviromentally friendly since ur recycling but its a $ saver n it looks like great fun. 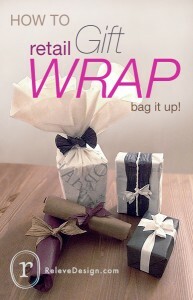 Try out wrapping gifts with magazine pages or newspapers 2! Great way to be creative will do for every occasion thanks! The way I see it we already paid for the “wrapping paper”. 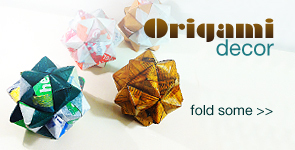 It’s just in a the form of a paper or plastic shopping bag, and requires just a few aesthetic tweaks. 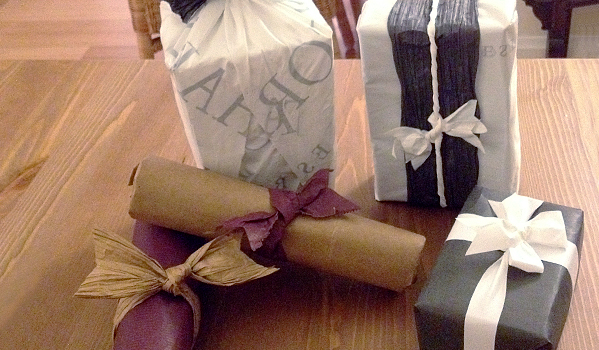 Using magazines and newspapers to wrap gifts are DEFINITELY A GREAT IDEA! While we are on the subject of literature…being the big nerd that I am, I have a lot of old comic books. 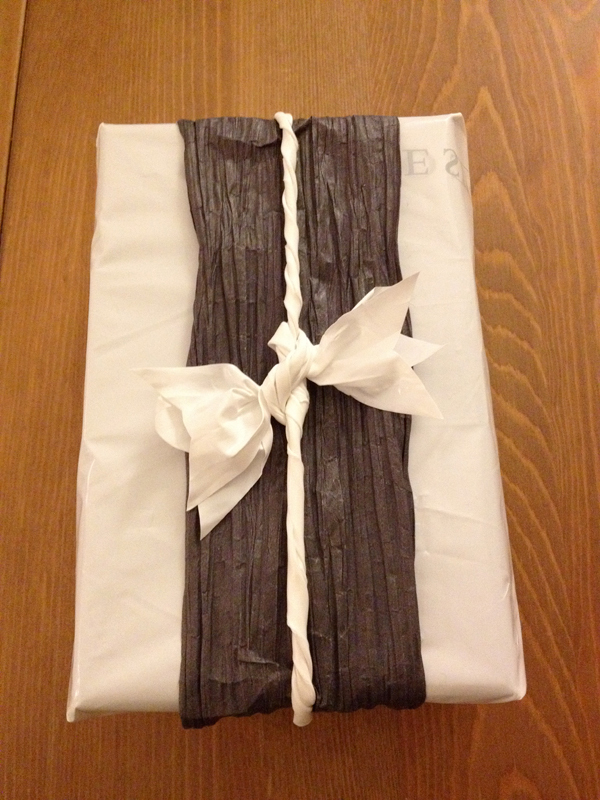 You can use pages of comic books to wrap gifts as well. It would be cool for a child or the nerd in your life. 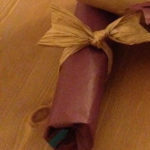 Just make sure that it’s not a vintage comic book that’s worth a boatload of moolah, cause that would be some REALLY expensive wrapping paper! 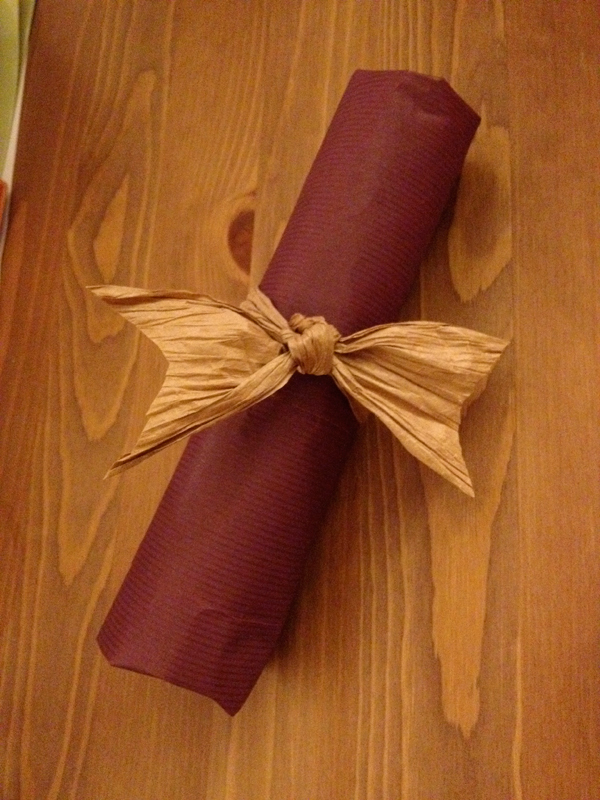 My other medium of choice is packing paper. 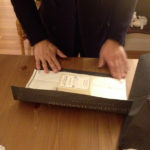 It comes with your packages when you order stuff online, and it’s usually white, off-white, or brown. I have a couple rolls collected from my own packages. 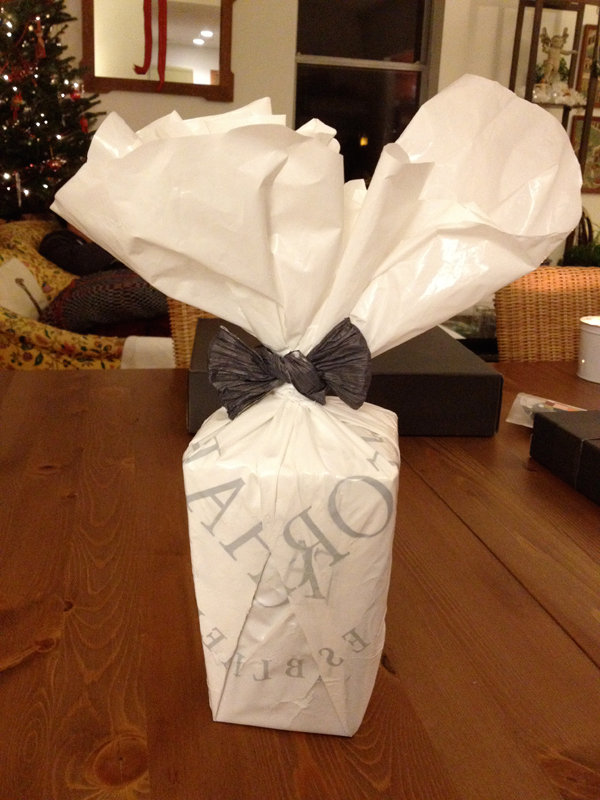 The neutral colors can make for some sophisticated wrapping. Pair another color with, and it really pops. Adding color also matches it to different occasions – brown paper with orange or black for Halloween, pastels with off-white paper for Easter, etc. Again, you’ve already paid for it, so you might as put it to use! Sarah, thanks for your wonderful suggestion. 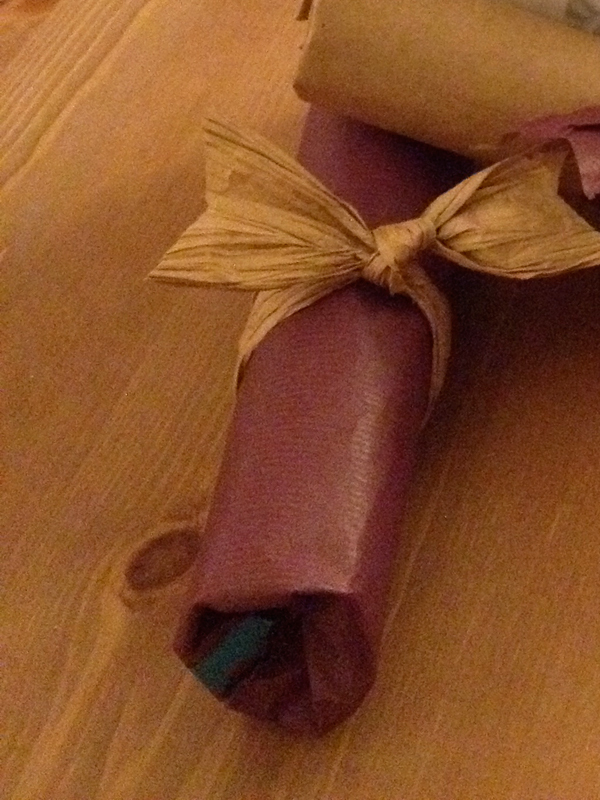 As you pointed out, there are so many budget friendly, eco-friendly gift wrapping options. 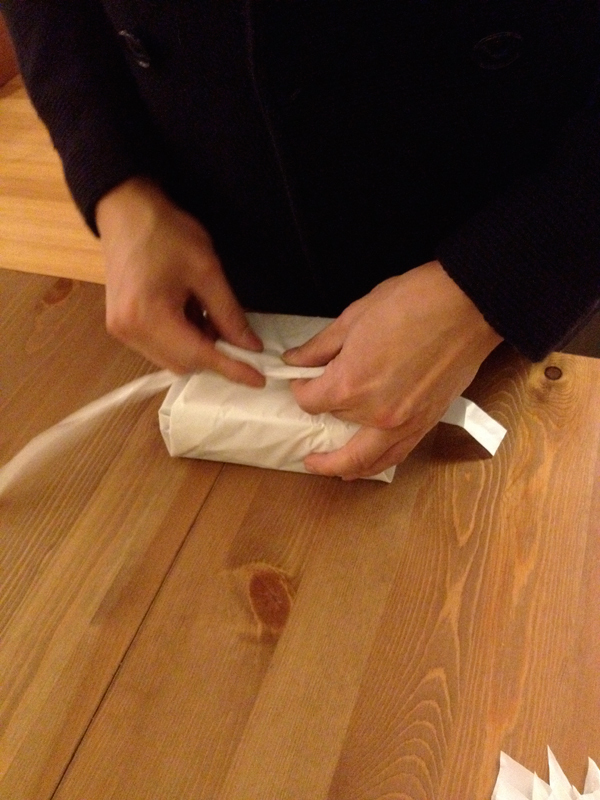 There’s really no need to buy wrapping paper! Thanks for watching and thanks for the kind words, Cory! 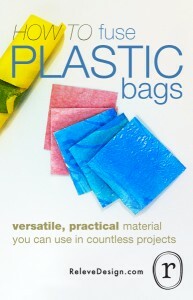 Plastic bags can look sophisticated too! It just takes a little tweaking to see it in a new light. I hope you get to try it out! 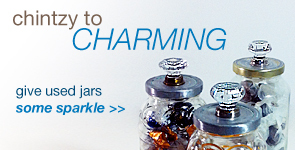 Take pictures of your jars. I’d love to see what you do with them! You are amazing and creative! Thanks for always giving such great idea’s as well as very very easy instructions to follow! Keep up the great work..thanks again!